Fencing is one of the most important parts of your property. It clearly marks where your land begins and ends. While this is more important for folks who live on ranches and large parcels of land, it can also be important for homeowners who live in neighborhoods where homes are built close together as well as to set a precedent for the type of quality of home you own. You’d be surprised how many people take note of the fence when they drive by a property. In fact, realtors widely regard it as a major selling point that improves the curb appeal for all types of property whether it’s commercial or residential. 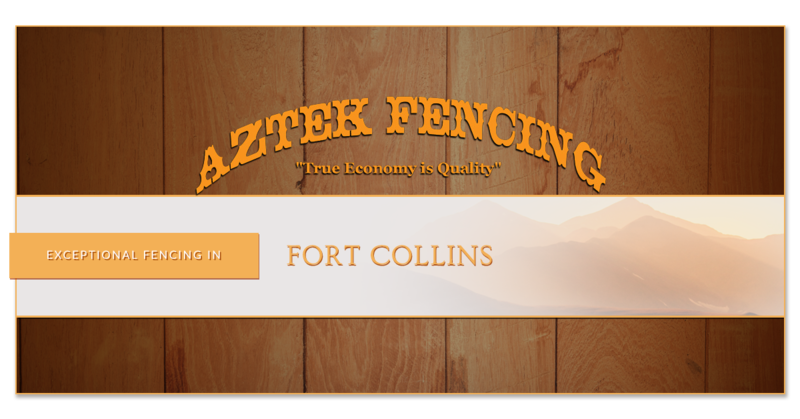 Aztek Fencing provides the premier quality fencing to the entirety of Fort Collins. We proudly protect, make and enhance your property with fencing projects that we come together on to create something that is both utilitarian as well as stylish and reflective of your home’s aesthetic design. As the most popular Fort Collins fencing contractor, Aztek Fencing is very familiar with the trends in fencing over the last 25 years. We know better than anyone how much wood fencing has monopolized the market, but are there other, potentially better fencing options for your yard? Could your residential fencing use a more modern look via PVC fencing products? As long as you’re not DIY-ing your fence, you have a variety of options in materials that we can help you navigate. PVC fencing is made from the same petroleum-based plastic as PVC piping options are. Gradually, the material is becoming more popular as a fencing choice for most developers. At first, they were only white, not very natural looking, white stalks sticking up from the green grass and the overall look was an acquired taste. But now, there are a variety of colors coming out and are now available to make this alternative material a more attractive option. The manufacturers have even gone so far as to texture the PVC like wood to create a more realistic feel. The main advantages lie first in the fact that it won’t weather. You’ll never have to repaint this fencing, and possibly will not have to replace these pieces of fencing. That being said, it’s hard to achieve a “designer” look when you’re working with PVC detailing instead of wood. The patina and weathering of natural wood, including the real grain of the material, add character and uniqueness to your home landscape more effectively than PVC ever could. In general, developers and homeowners who purchase PVC fencing are aiming for the ease of installation aspect of the material. Doing it yourself is easier when you’re using PVC fencing. If you’re looking into hiring a fencing contractor, it’s probably better to request wood fencing instead. PVC panels have grown more widely available in pre-assembled packages. This has lowered the cost considerably but has also limited the number of options you have for your fencing. A panel that’s 6 ft high and 8 ft long of white PVC will cost around $98, while a red cedar, arguably one of the more attractive species of wood, would only cost $109 per panel of the same size. That means you’re looking at around $10 more, with a similar installation cost from your fencing contractor for an exponentially more attractive fence. However, PVC wins the maintenance battle. PVC fencing materials do not require maintenance in any way, shape or form. They don’t need to be sealed, they don’t need to be stained, they don’t need to be painted and they won’t decay at all. In fact, if we were to recommend PVC for any type of fencing, we’d suggest using it for agricultural uses because of it’s low maintenance attributes. If you’re looking for commercial fencing options, don’t even look twice at wood. Chain-link fencing is probably one of the best security options out there currently and is only rivaled by specialty fencing like wrought iron. If you’re not trying to be Woodward with a sprawling green campus, mandatory haircuts and wrought iron fencing, we understand. We recommend chain link fencing for nearly all commercial uses for a few reasons. Though it seems slightly macabre and potentially morbid, there’s a reason prisons use giant chain-link fences. They’re great at keeping things both out and in. The truth behind the security abilities of a chain-link fence lies entirely in that it’s remarkably strong and see-through. A solid barrier is preferable when trying to create privacy, it also gives potential intruders with a place to hide. Thus, rendering it counterproductive for security measures. When weighing wrought-iron against chain link fencing, the important piece of information to consider is that chain link fences are not attractive. Wrought-iron fences, however, are very attractive and can even be aesthetic in comparison to chain-link fences which add a more commercial utilitarian feel versus a put-together look. The curb appeal of your house matters even in the hot housing market that is currently gracing the Colorado real estate arena. The quickest way to add curb appeal to any property is to alter the landscape and the most effective and permanent means of accomplishing this task involves fencing. Building a new fence with a reputable fencing contractor’s skills and opinions in your back pocket can both increase the value of your residential property as well as make it more attractive to home buyers passing your house and approaching it. Making a great first impression with a quality fence that adds to the charm and aesthetic of your property will not only make it sell faster, it will increase your standard of living while you remain there. We’ve collected a few ways to make your fence pop so that you can improve your home with a set strategy. Ornamental and specialty fences are capable of adding so much beauty to any space. They’re also known for tying in style components and creating an overall theme for a home. While there are a variety of ways to accomplish this on a fence without using wrought iron fencing, it’s certainly the quickest route to those desired results. You can create a similar effect by using the evenly spaced posts to create a consistent pattern across the entirety of the fence. We recommend hanging planters off of the individual posts. It will create a similarly organized design appeal of evenly spaced design elements that brings the landscape together with cohesive overhead themes and patterns. However, wrought iron fences add the same sophistication and elegance to the landscape in a single swoop. You could go so far as to go with a different color to add a unique element to the fence, this is especially easy to do if your home is surrounded by a variety of foliage which will calm down the more dramatic hues of the fence’s color. The classic white fence with a background of lush greens always makes everyone’s heartbeat a little faster. It’s the visualization of the American Dream: a little picket fence, a beautiful home to call your own. It brings the look of the home together with ease, provides privacy and provides a wonderful aesthetic that is sure to attract future home buyers. Whether you’re in need of guidance on your commercial fencing project, your agricultural fencing needs or need to update your residence to accommodate the competitive housing market, we’re here to help. For such a simplistic structure it can be shocking the sort of results you can achieve from a new fence, ranging from increased privacy, an attractive design, or better utility than your current fence or open land, the possibilities are endless. When you’re in need of a fencing contractor to complete your new fencing project right, turn to our high-quality service. We’ve managed to offer the people of Fort Collins distinguished fencing designs that benefit their properties and their lives for 25 years and we intend to continue for another 25 years. Reach out to us to schedule your initial consultation.